Your Price Please select employee number to get price. CalChamber Executive memberships are designed for proactive industry leaders who want to affect those changes. 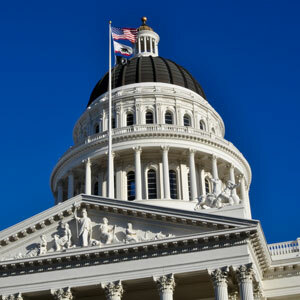 As business leaders, you've experienced the California Legislature's influence on your company firsthand. From workers' compensation to family leave, the decisions made at Sacramento can translate to powerful changes in the workplace. Executive memberships are designed for proactive industry leaders who want to affect those changes. And since we know today's executives are busier than ever, we've tailored this membership to include our full range of Preferred compliance benefits to make daily life that much smoother. Influence: Give input on CalChamber policy recommendations for topic areas ranging from health care to taxation. Involvement: Attend invitation-only policy planning events in your region. Updates: Receive quarterly Executive Reports from CalChamber CEO Allan Zaremberg on key legislative issues. Unlimited Calls to Labor Law Helpline: With the complexities of managing employoment issues, not every question necessitates legal counsel. The Helpline is here for those times, providing a better understanding of laws, regulations, court cases and administrative procedures. If you need to consult your attorney, we'll let you know. If not, you've just saved yourself the time and expense. 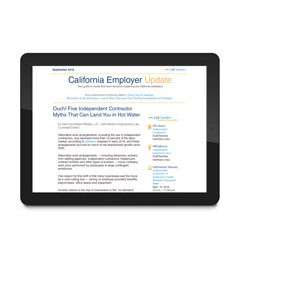 Reference clear explanations of California and federal employment laws and regulations. Learn common compliance mistakes and best practices. Download more than 400 HR forms and checklists. Determine employee exempt/non-exempt status and simplify other HR taks through fast compliance wizards. Read the extensive Q&A section for quick answers on a full range of HR topics. 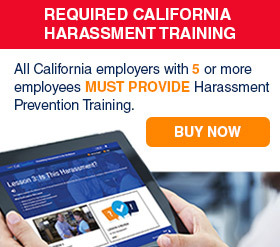 Get breaking news updates that affect how you conduct business through the HR Watchdog blog and HRCalifornia Extra.